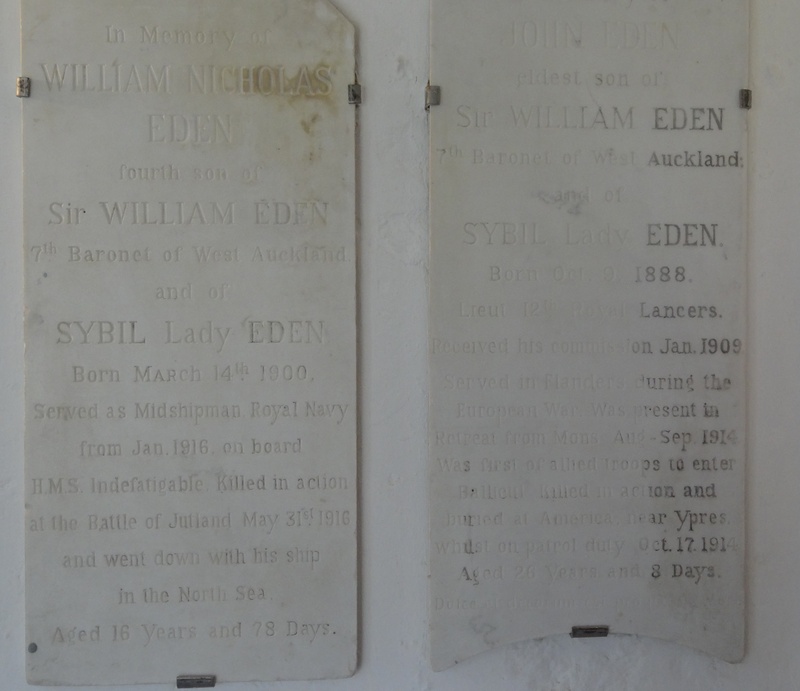 In memory of William Nicholas Eden fourth son of Sir William Eden 7th Baronet of West Auckland and of Sybil Lady Eden born March 14th 1900. Served as Midshipman Royal Navy from Jan 1916 on board H.M.S. Indefatigable. Killed in action at the Battle of Jutland May 31st 1916 and went down with his ship in the North Sea. Aged 16 years and 78 days. The memorials to the Eden family were moved from the mausoleum at Windlestone Hall, near Rushyford after the family vacated the property. John and William Nicholas Eden are commemorated on the war memorial at Kirk Merrington, near Ferryhill, County Durham. Windlestone Hall presumably was within this Parish.